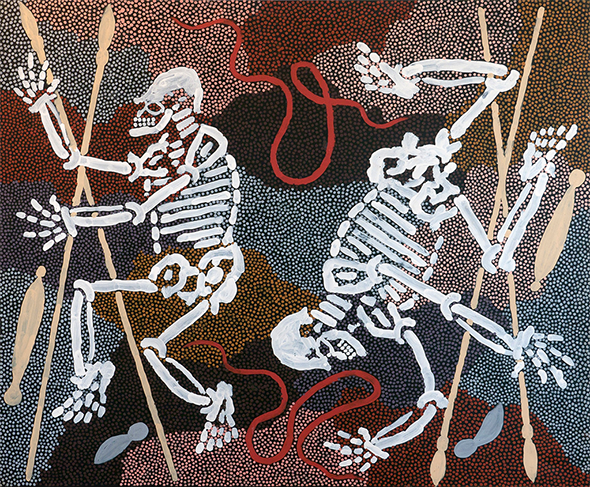 The skeleton figures represent the two Tjungala brothers who perished in a magical bushfire at Warlukurlangu. It is the conclusion of an epic journey the boys make to escape the flames but eventually they are roasted in the sand when they return home believing that all is forgiven. It is a cautionary tale with a clear moral that is known to all the residents of the Western Desert. 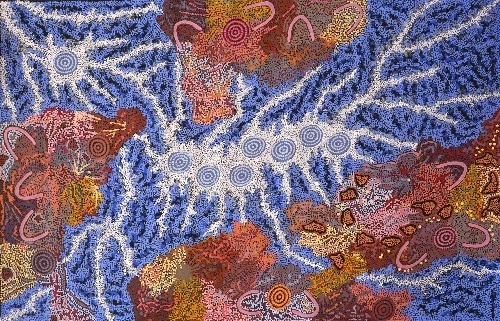 The boys’ father is the Blue Tongue Lizard man, the old Lungkata. He asks his two sons to go out hunting and instead of traveling out into the desert to look for game, they kill and roast the old man’s sacred kangaroo. When he returns from ceremonies to find his sons cooking his pet he becomes enraged and uses his blue tongue to light a magical fire. The boys flee with their two spears, woomeras, stone knives and headbands, which are all illustrated, and travel as far as South Australia until they notice the flames dying out. They cautiously return home over the black & charred landscape until they reach Warlukurlangu and it is here that the meet their end and die under the sand as the inferno passes overhead.